The Best Turkey Stuffing Recipe in the World! This is simply the best turkey stuffing recipe I have come across. I make it every year for Thanksgiving whether I am grilling or roasting a turkey. It is even great if you aren't making a turkey or at other times of the year! 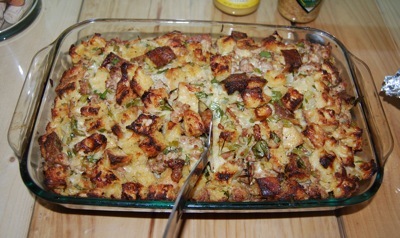 It is a hearty, rustic sausage stuffing recipe that is delicious on its own. You don't need to stuff a turkey with it, I usually just make it separately in a big cooking dish or casserole. It could be served at other times with turkey, chicken, and game birds. However, rich, hearty stuffings like this make me think of winter so I tend to make it for Thanksgiving and throughout the winter season. Besides loving it myself, I know this is the best stuffing recipe because all my guests comment specifically on the stuffing. It is the star of the evening and no matter how much I make it is polished off by the end of the night. 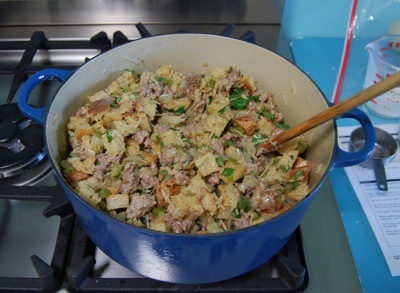 Of note, some of this sausage stuffing recipe can be done ahead. 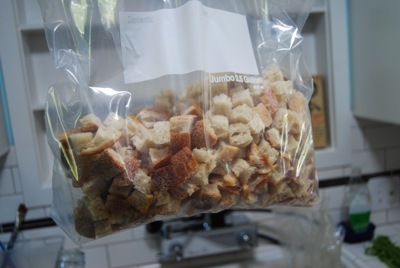 The bread can be toasted up to 3 days ahead and kept in a sealed bag at room temperature. The rest of the stuffing can be prepared earlier in the day of serving but not baked, up to about 4 hours before roasting. One 3/4 to 1 lb round Italian loaf of bread - Cut into 1-inch cubes. A paesano serves well for this purpose but you can use any rustic Italian or French loaf. 2 lbs sweet Italian sausage - You just need the inside of the sausage with the casings removed. Around Thanksgiving time a lot of markets sell bulk mild Italian sausage without the casings just for this purpose. 1 stick unsalted butter - cut into pieces. 3 medium onions - chopped. 4 large celery ribs - chopped. 5 garlic cloves - minced. 4 large eggs - lightly beaten. Preheat the oven to 350 degrees and generously butter a baking dish. Put the cut bread cubes in a shallow baking pan and bake at 350 until just dried out, about 10 minutes. Set a timer so you don't forget about them and burn a loaf's worth of bread! Heat 1 tbsp of olive oil in a skillet over medium-high heat and cook half the sausage, stirring and breaking it up into small pieces until golden brown, about 6 to 10 minutes. 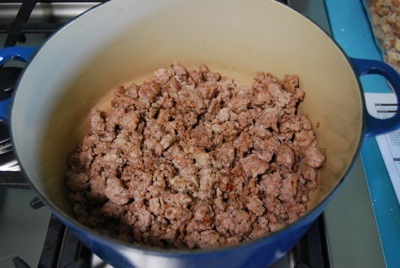 Set this aside and then do the same with the other half of the sausage with a bit of additional oil if necessary. Set aside the sausage and wipe the pan clean of excess oil, but do not clean it if it has bits of crusted sausage in the bottom. 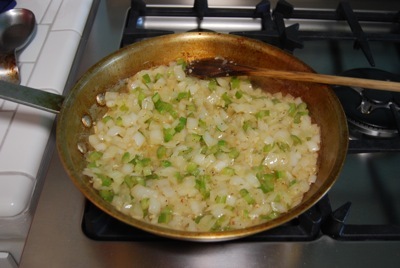 Heat butter in the pan on medium until the foam subsides and add the onions, celery, garlic and 1/2 tsp each of pepper and salt, stirring occasionally until the vegetables are golden, about 12 to 15 minutes. In a large pot, combine the veggies, bread and the sausage. In a separate bowl, whisk together eggs, 1/2 cup cream, turkey stock, cheese and parsley and then stir this into the stuffing. Let cool completely, about 30 minutes or more. At this point you can adjust salt and pepper as needed but be aware that there is raw egg in there so you could get sick from eating any at this point. Use some to stuff the turkey (if you wish, but you don't have to), and put the rest in a large baking dish (such as a ceramic or glass casserole). Drizzle the top of the stuffing with 1/4 cup cream, cover tightly and chill until ready to cook. Bring back to room temperature when ready to bake and preheat an oven to 425 degrees. Cook the stuffing covered in foil until hot throughout, about 20 minutes. Then remove the foil and continue cooking until golden and crisp, about 15 minutes more. Your delicious, hearty turkey stuffing is now ready to serve. Simply let guests scoop themselves heaping platefuls with a big serving spoon and watch the happy faces appear! Happy Holidays! I hope you enjoy this turkey stuffing recipe as much as I do! Done with the Turkey Stuffing Recipe? 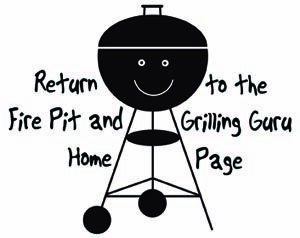 Return to the Barbeque Grill Recipe Section.